The Enterprise is dispatched to investigate a disturbance in the Neutral Zone. What they find is three fugitive Klingons on the lam, hiding out in a burning Talarian freighter. When it becomes evident what these Klingons are running from, Worf's loyalties are called into question. Will he follow his Starfleet duty, or will he help his estranged brother Klingons? RAAAAHHH!!! For the last time, get that boom mike out of frame! Matthew: Let's discuss the science fiction aspects of this story ... OK, now that that's done, we can move on. What I am trying to say here is that this story depends entirely on characters, and established political relationships in previous Trek stories. There is literally no science fiction, apart from the fact that we are on a starship that goes faster than light, and perhaps very tangentially the use of Geordi's VISOR. I'm willing to chalk that fact up as a detriment, which means an episode has to really fire on its other cylinders to make me happy. So how is it as a character developer? Well, Worf finally gets fleshed out with some backstory, his being orphaned, raised on a farm planet, having a stepbrother, etc. So this is a good thing. We are also reintroduced to the Klingon Empire, now allied with the Federation. The theme of Klingon bloodlust and honor is explored, and plants the seeds for later Ron Moore Klingon stories. Worf is tested along these lines, questioning where his loyalty lies. On that score, it's reasonably effective. Kevin: I agree. It's great that Worf finally gets some character development, and it does lay the groundwork that Ron Moore will eventually run with. As I said in the review of Coming of Age, there's a point where the characters get developed enough to carry an episode that can be great even without a strong science fiction backstory. To the writers' credit in this episode, the Klingon culture we get feels consistent and credible. It's not merely a hodgepodge of philosophy 101 statements that exist only to serve the plot. I personally found the death ritual pretty effective. Also, the test of Worf's loyalty is far more credible here than, say, Datalore. His orphan status makes his yearning for a connection more believable. Matthew: Unfortunately, this tale suffers from one of the worst sins Kevin and I have identified in out blogging thus far - the necessity of characters acting stupidly in order to advance the plot. 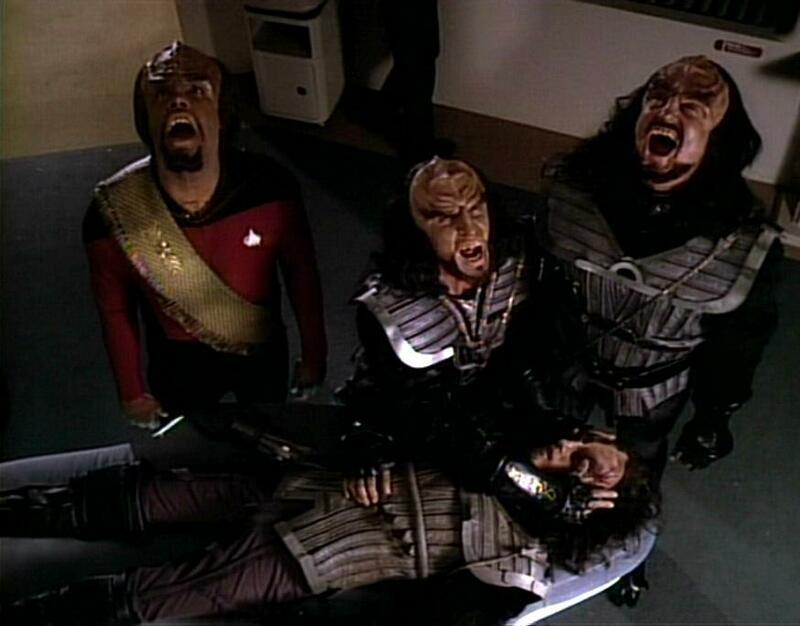 There is simply no believable reason that the Klingons should escape the brig. In addition to not being searched or scanned in any way, after being told by the other Klingons that these are criminals, they are also placed in a brig with no visual supervision while the construct and use their weapon to escape. Worse than stupid security personnel is Worf's behavior. After he has been told that they destroyed a Klingon vessel, Worf agrees to take the Klingons on a tour of sensitive areas of the ship. All of the nice things we learn about Worf are called into question by this. Is his judgment impaired? Is that how we're to take the story? Or is it just bad writing? Given the conclusion, I'm going with bad writing. Kevin: Yep. I agree fully. Starfleet Security once again.demonstrates its awesome awesomeness by failing completely at even the most basic elements of securing. If nothing else one of the components in the uniform had to be a power pack for the disruptor and the transporter if nothing else should have picked it up. There's a shot of them assembling the disruptor seen from outside the cell. I was yelling at the television like I do at the blonde woman in a horror film to not run upstairs instead of outside. Matthew: Now comes the time for Matthew's nitpicks. At the beginning of the episode, they mention trouble in the Neutral Zone. Which Neutral Zone? They mention that they haven't heard the name "Romulan" in a while. You'd think if it were thew Romulan Neutral Zone, they'd hear something from them right away. We get yet another same sounding alien, the Talarians this time. Terrellian? Tellarian? Ter-aylian? Whatever. The Geordi scene is interesting, but kind of superfluous. But why can't the Enterprise computer filter all but one spectral range for the viewers on the Enterprise? We get the first "dicey" transport in the show, one which strains credulity a bit in terms of the timing - they didn't show up until a good 5 seconds after the Batris blows up. As far as the Klingon death ritual goes, I liked the idea, and it fits well with the warrior ethos - but wouldn't SOME outsider have witnessed it before now? We're talking about a space-faring, expansionist race, in which warriors die in front of others all the time. And why did we get no death ritual for Konmel when he buys it during the firefight with security? Why doesn't main engineering have a secure door, especially given how dangerous it is to point a phaser at the warp core? Why doesn't Security simply beam Korris away to capture him? He's one of only two Klingons on the ship, and the other had a communicator. Korris utters a line about the "traitors of Kling" which sounds silly. I'm glad they renamed the planet Q'onos. Kevin: The lack of a door in Engineering is less troublesome for me as I can easily see the warp core having enough access points that a single barrier would be useless. Convenience would outweigh the risks. I would say that anything that could actually pose a risk to Engineering should be stopped before it gets on board. Looking at you, Security. The issue with the VISOR and its detection range always bothered me. If we can send signals straight to the optic nerve, why not just hook up a camcorder. You could even do one for each eye and restore binocular vision. The way they described it, it seemed like in order to get enough signal, you can't narrow the bandwidth that much. That seems to be a slightly BS explanation, but at least they tried. Overall, I thought that scene was really cool. It was just neat to see that part of Geordi's life explore from his perspective, and I like that they kept the color scheme for subsequent views through the VISOR. Matthew: This marks Vaughn Armstrong's first appearance in the Trek franchise, as the Klingon commander, Korris. It's easy to see why he was brought back in other roles. His line readings are very good, and he has a good, distinctive voice. These were uncharacteristically short Klingons, given what we would see later in the series. Kevin: I liked Vaughn Armstrong a lot too. Given this is the first exploration of Klingons as a culture, it comes down to the acting to convey what the writing hasn't developed yet, and he does that in spades. I also want to single out Michael Dorn for praise. They hadn't quite landed on the exact pitch of his stoicism yet, but they were getting close, and at each point in the episode, I bought the emotion he was trying to portray. Matthew: This was a good, competent Tasha Yar outing, giving Denise Crosby something to do for once. I mean, her staff sucked, but she came in and was solid in the clutch. Matthew: There's a lot to talk about here. The VISOR scene was pretty cool, with nifty effects. It looked like a heat map with some animation overlaid onto it, and it looked pretty good. I was wondering, however, why is the Data depicted in Geordi's vision the body double? They must have done these effects shots as side work without the principal actors. I wonder if Riker's body double was in those shots, as well. We also get a first look at the brig, which was so ineptly designed that they must have redone it after the great Klingon Prison Break of Stardate 41503.7. Kevin: Like I said above, the VISOR scene was cool. I remember watching this as a kid and seeing the hull stress, and thinking it looked like metal fatigue before Picard and LaForge identified it, and I was ridiculously proud of myself for that. Matthew: Although the Batris model was pretty ho-hum, it looked like a spaceship, and the interior wreckage was very well done.The smoke and lighting effects were very effective. We get a re-use of the D-7 class ship from TMP, which is always nice to see. Kevin: The interior of the Batris was cool. Lots of rooms and corridors gave the ship a very credible feel. They've really milked that shot of a D-7 from TMP, haven't they? Matthew: We get a nice view from upper engineering which has been rarely seen thus far. I do have questions, though - When Korris falls through the glass, why would the top level glass break, but not the lower level? He should be falling faster and with more force by that point. You would think the glass would be rated for much more weight, too - why is it so weak other than for dramatic reasons? Kevin: Turbolift rides, replicator capacities, shield endurance, context sensitive comm systems, and we can add the strength of the glass in Engineering. There must be a dedicated computer core solely for making sure the Enterprise functions as dramatically as possible. Matthew: I just can't in good conscience go above a rating of 3, here. There is a bunch of neat stuff to maintain the viewer's attention in this episode, but the stupid is powerful in this one at certain points. The character of Klingons gets a good updating from the TOS days. Worf, despite some inconsistency, gets some development. But Enterprise Security will take a good long while to recover from this embarrassment. Kevin: This is a 3, and I'm happy with that rating. An underused character and actor gets a nice outing and because of a strong guest actor, the moments have the emotional impact they need. Plot points don't bear too much scrutiny, but overall, I enjoyed this episode. It's certainly in the average territory, and probably in the top half of season 1. That makes for a total of 6. The Battris explosion definitely looked better in HD. The scenes on board the Battris showed really nice contrast and detail. Overall, though, this episode was rather mushy in a lot of dark scenes. I like how the Klingons are depicted in this episode. In fact, it is the one and only time in all of Trek that they aren't depicted as dumb, violent and primitive animals whose knuckles should be bleeding from walking around. They actually can construct full, thoughtful sentences without growling, hissing, spitting and roaring and each other. I really wish they would have continued depicting them as such. In this episode they actually make sense as a space faring species because it appears that its members have other interests beside bloodshed, bat'leths and battle. In fact, I have always wondered how a species that never appears to have made it past the primitive cave man stage could have spaceships. In order to thrive as a civilization and species, dont you need things like scientists and engineers? How did they develop all this technology when everyone always just wants to be a warrior and kill or be killed (which seems to be their goal in life) in battle after battle? Where being anything else is seen as cowardly? Do they have universities on Kronos? Research labs? Medical facilities? Libraries? barber shops? Klingons just never made sense to me as a species. Even the idea that they stole that technology doesn't make sense since that would require some kind of an ability to make it into space to actually encounter other species to steal from. TNG's "Suspicions" addressed some of your concerns, but yes, I agree the portrayal evolved. What do you think of the DISCO "Klingons?" They're even worse by your metric.